kandeej.com: The World's Largest Make-Up Show! Yes...I will be at the BIGGEST IMATS (International Make-Up Artist Trade Show) in Los Angeles! 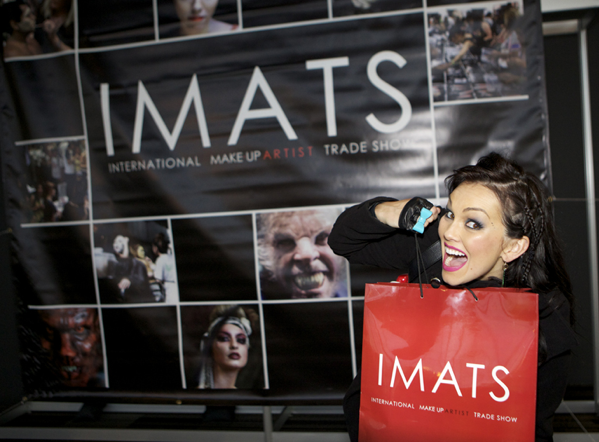 The LA IMATS is the largest make-up show of it's kind, in the world!!! It's June 25 & 26 in Pasadena, California. ANYONE CAN COME...you do not need to be a pro make-up artist. Although they do have a special PRO only night now. When I spoke at IMATS in Toronto they ran out of seats and some people couldn't see or they were standing so far they couldn't hear...so if you're coming, get there early to get a seat. I don't think I'll be at IMATS on Saturday....but for sure on Sunday! I am still trying to see if we can do a meet and greet. I'm not sure because the line was so long at the Toronto IMATS, some people waited in line over 4 hours to say hi and get a picture...and I felt so bad people were standing that long. IMATS is so fun! I've been going for years...you get crazy deals and discounts up to %40 off on some of my favorite brands. *everyone who attends IMATS get the deals too! Make-Up Forever, Ben Nye, NYX, Graftobian, MAC, Dinair, Kryolan, Model In A Bottle, Naimie's, Alcone...Zuca Bags always has crazy deals. The Crown Brush booth is always insanely busy...that's where I got my first, and awesome flat chisel brush for contouring the cheekbones ...at IMATS years ago. the room only seats 500...and for the first 500 people coming to see me speak...you will get a special surprise from me and URBAN DECAY!!! A fun goodie from Urban Decay and a special something that won't be announced until the day of! HOORAY!!!! Can't wait to see you guys there....it's gonna be so fun! I love getting to see your smiling faces in person, with my very own eyeballs!